Appeals Court Hears 26-State Challenge To Health Law : Shots - Health News A three-judge panel of the 11th Circuit Court of Appeals heard oral arguments Wednesday in the much-watched case against President Obama's health overhaul law. The government is appealing a Pensacola judge's February ruling that the entire law is unconstitutional. Mike Griffith of Canton, Ga., holds a sign during a protest against President Obama's health care law outside the 11th Circuit Court of Appeals in Atlanta on Wednesday. Atlanta was today's host city for the latest skirmish in the battle over last year's federal health overhaul, as the measure went before a three-judge panel of the 11th Circuit Court of Appeals. The judges heard oral arguments in the much-watched case brought by Florida and 25 other states. The government is appealing a ruling by Pensacola federal Judge Roger Vinson, who in February ruled that the entire Affordable Care Act was unconstitutional — not just the section requiring most Americans to obtain health insurance starting in 2014. Two other appeals courts, one in Cincinnati and one in Richmond, Va., have already heard arguments in three other cases. In two of those cases, lower court judges upheld the law; in one, the judge found just the "individual mandate" unconstitutional. The latest case technically carries no more weight than any of the others, but you wouldn't know that from the disproportionate amount of publicity it's received. In part that's because of the backing of two dozen states and their press officers, as well as their co-plaintiff, the National Federation of Independent Business, a powerful small-business lobby. The makeup of the panel that will decide the case has also drawn attention. Nominally it consists of two Democratic appointees and one GOP selection. But the presiding judge on the panel, Joel Dubina, is the father of Alabama GOP Congresswoman Martha Roby. Rep. Roby is an outspoken opponent of the health law. The 11th Circuit judges in Atlanta wasted no time getting right to the crux of the matter: whether forcing Americans to buy health insurance or face a financial penalty fits within the bounds of the Constitution. "If we uphold the individual mandate in this case, are there any limits on Congress' power left?" asked Judge Dubina. "Absolutely," responded acting U.S. Solicitor General Neal Katyal. He argued that the decision not to have health coverage is an economic one that shifts the cost burden to everyone else, an activity governable under the commerce clause. 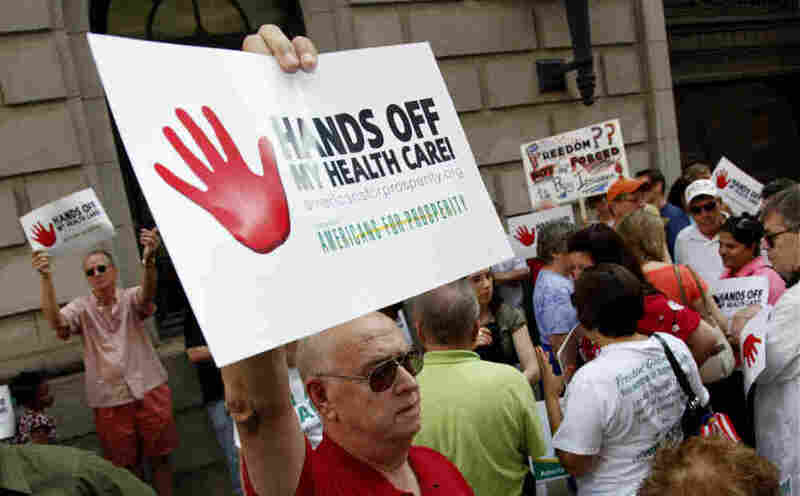 The states that sued, and the National Federation of Independent Business, argued that the health care law infringes on individual liberty and unduly coerces states to expand their Medicaid rolls. Arguing for the states, former Solicitor General Paul Clement said Congress can't compel people to buy health insurance if they're just sitting in their living room and not actively participating in the health care market — say, at a hospital seeking treatment. The appellate courts will certainly help shape the legal debate over President Obama's health care overhaul. But their rulings will not be the end of the line. Judge Dubina today told lawyers that the case was no doubt headed to a higher court — meaning the U.S. Supreme Court.